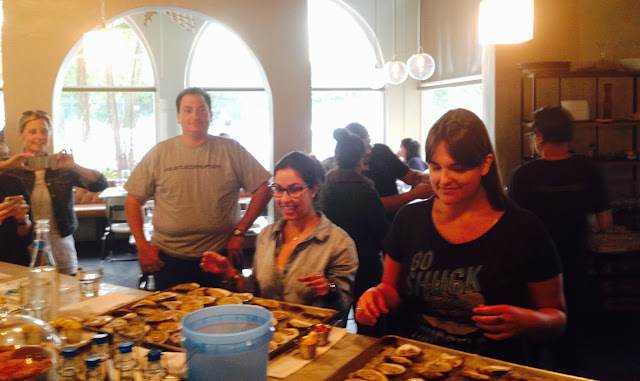 Yours truly slurped his way to the Mignonette Mollusk Madness Finals which will take place this Monday, April 4, 2016 at 6 p.m. at the Mignonette bar. Please swing by and watch me get crushed by the last minute bracket busting replacement, Paula Echevarria the award winning producer of Check, Please! It's a battle of New Orleans, Tulane v Loyola. Contestants had 60 seconds to take down as many oysters as possible. In round one I won a close match against Jonathan Zaslow from 790 The Ticket by crushing 27 oysters. The brackets were re-seeded after round one. In the Final Four I faced tough competition from Ale Cangas at the Hungry Post but moved on by taking down 30. For the finals it looks like I will need to take down 35-40 to win it all. I'll be ready to roll. Huge props to "Shuck Norris" shucker extraordinaire who did a fantastic job. The event got off to a strong start that featured Carla Torres, Assistant Editor at Ocean Drive Magazine against Paula. I'm not sure what the final score was but I know Paula took down more than me. Strong showing by Gio from Chat Chow TV for taking down a whopping 6 oysters (Full disclosure, yes he was looking for pearls...) against food writer Lee Klein. The final match of round one featured Ale v PR whiz, Larry Carrino of Brustman Carrino. Ale pulled of an impressive upset. But no shame in the Carrino game. Team Carrino had their game faces on. The first final four showdown was a battle between Lee and Paula. Paula prevailed by taking down 35 or more oysters. I was prepared for a tough challenge from Ale and I knew it was close based on the crowd noise. 30 for me was enough to move on.